The foundation of a structure determines the strength of the entire building, holds the weight of that structure and establishes the integrity of all that follows. Every room in that building may look beautiful and have an immediate wow factor but if the heart of the home is flawed and weak over time things will begin to change and that wow factor will become something considerably different. 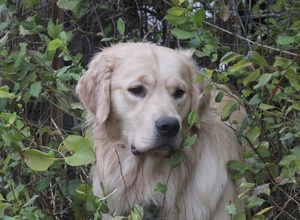 We are pleased to introduce William, the cornerstone of Council House Goldens. William means “resolute protector” and our boy remains true to his namesake. His strong pedigree and health clearances along with his astonishing intelligence and heartwarming sweetness give us so much to hope for in his offspring and your future family companion. See Williams' home page here.